The spine is a very intricate structure and when one component fails to function properly it can affect the entire body, causing pain and loss of mobility. Tiny bones, called vertebrae, are stacked on each other to form the spine. They are joined in such a way to facilitate movement, flexibility, and a wide range of motion. There are small, fluid-filled discs that rest between each vertebra, providing a cushion between the bones. When one of these discs becomes damaged it can affect the surrounding nerves, causing pain and making movement difficult. A herniated disc is one of the most common spinal disc issues. A herniated disc is a common spinal condition that typically affects the cervical spine (neck region) or the lumbar spine (lower back), although it can occur in any part of the spine. 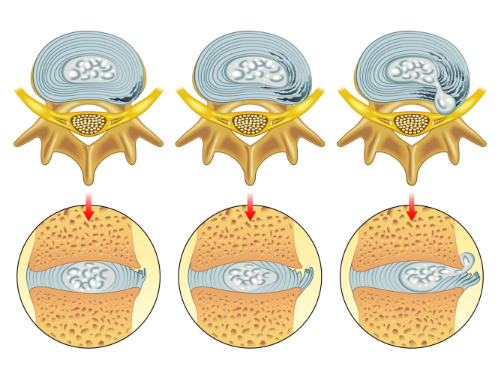 Most often, a herniated disc occurs at the L4 – L5 and at the L5 – S1. This is because this portion of the spine, the lumbar region, bears the bulk of the body’s weight. It is often referred to as a ruptured disc or slipped disc and occurs when the disc moves or slips out of place. It can also be the result of a disc that has a small tear and is leaking the jelly-like substance that is inside. This can put pressure on the surrounding nerves, causing pain and discomfort. What are the Progression and Symptoms of Herniated Disc? The first two stages are called incomplete herniations while the last two stages are called complete herniations. A herniated disc can have several causes. The most common are aging and degeneration, overuse, and normal wear and tear on the body. A herniated disc resulting from an injury or trauma, such as a blow to the back, is less common, but it does happen. Because the back does bear most of the body’s weight, it can put a significant amount of pressure on the spine and discs. Over time, the discs may begin to weaken and a herniation can occur. Injury or trauma that results in a herniation may include a car accident that involves sudden jerking, or incorrectly lifting heaving objects can put excessive pressure on the spine, causing it to herniate. A physical examination is usually the first step in diagnosing a herniated disc. The physician or chiropractor will examine the spine while the patient is standing, then while they are lying down. Depending on the severity and location of the herniation, they may note a decrease in spinal curvature. Radicular pain will also be assessed, when the spine is unmoving, while in motion, and when pressure is applied. Other tests may also be administered. X-rays may also be taken, but an MRI is usually more accurate and provides greater detail. What are the Treatments for Herniated Discs? Medications may be recommended or prescribed, including NSAIDs, narcotics, muscle relaxers, and anticonvulsants. Some doctors may advise cortisone injections to reduce inflammation. Physical therapy may be recommended as a stand-alone treatment or in conjunctions with other treatments. Surgery for herniated discs is rare and usually reserved for a last resort option. Chiropractic has been very effective in helping patients manage their pain and regain their mobility so they can return to their normal life. Therefore, it should be your first option for treatment before you go down the road with drugs or surgery.